Studies show consuming protein before bed results in greater gains. Learn how to use it to your advantage. Let’s face it, the primary reason we lift weights is to gain muscle and get stronger. But you won’t get very far if you don’t fuel your body properly. For that reason, it’s important to understand not only what to eat, but when to eat. 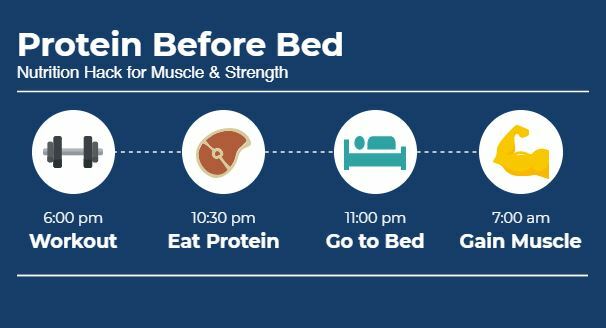 And protein before bed may be the extra edge you need to reach your muscle building goals. It’s important to realize that recovery precedes growth. In other words, working out is like digging a hole. And you have to fill the hole back in before you can grow. With this in mind, consuming protein improves recovery by filling in the hole. Specifically, it creates a positive protein balance, which is vital to gaining muscle. To illustrate, Maastricht University Medical Center conducted a study1. In the trial, all subjects worked out and had the same post-workout meal. Then one group had a protein shake before bed while the other did not. Overall, the protein group had 22% higher protein synthesis. As a result, their protein balance was positive while the placebo group was negative. 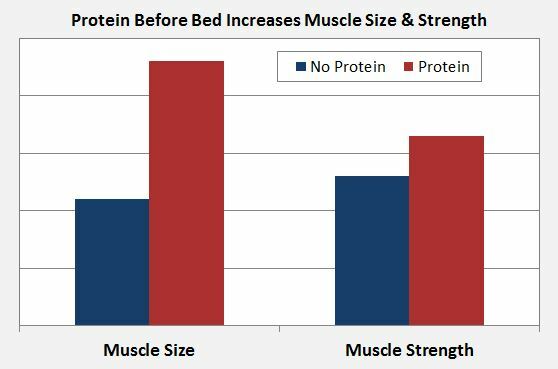 In this case, protein before bed could be the difference between muscle gain or staying the same! Adapted from Res, et al. 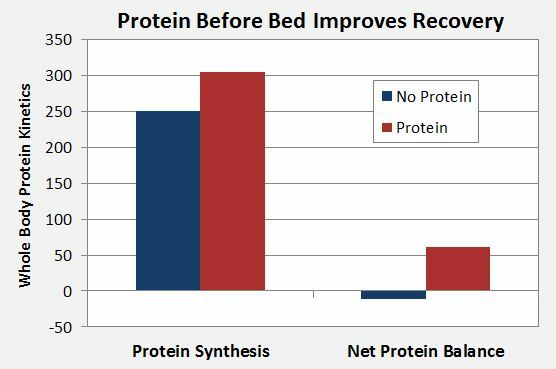 The previous study showed that protein before bed improves recovery from training. But does that recovery actually translate to muscle size and strength gains? In a study published by the Journal of Nutrition2, 44 men completed a 12-week resistance training program. Half of the men were given protein before bed and the other half were not. As can be seen in the chart below, the group that received protein had about double the increase in muscle size. In addition, the protein group had greater strength gains. Adapted from Snijders, et al. Whey or Casein Protein Before Bed? Interestingly, all of the studies I read while researching this article used casein protein. Presumably, because it’s known to be slower digesting than whey. So you can’t go wrong with casein before bed. I personally use Gold Standard Casein from Optimum Nutrition. On the other hand, whey stimulates protein synthesis to a greater extent than casein3. And that increase in protein synthesis at night is what results in muscle and strength gains. Therefore, it stands to reason that whey protein could also be used before bed. Studies used anywhere from 20-40 grams of protein. 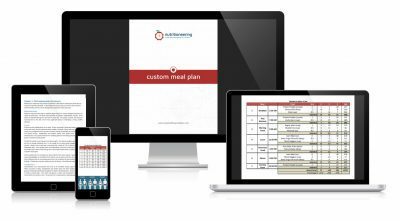 You can get your personalized target with a Custom Meal Plan. In summary, it’s clear that a dose of protein before you go to sleep increases protein synthesis. And that leads to greater muscle and strength gains. Of course, you can’t just drink a protein shake before bed and expect to get immediate gains. Instead, you need a structured nutrition plan for every meal of the day. So head over to the Muscle Gain Meal Plan page to learn more about a personalized 12-week meal plan that includes protein before bed. 1) Res, Peter T., et al. “Protein ingestion before sleep improves postexercise overnight recovery.” Medicine & Science in Sports & Exercise 44.8 (2012): 1560-1569. 2) Snijders, Tim, et al. “Protein ingestion before sleep increases muscle mass and strength gains during prolonged resistance-type exercise training in healthy young men.” The Journal of nutrition 145.6 (2015): 1178-1184. 3) Tang, Jason E., et al. 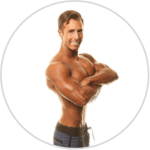 “Ingestion of whey hydrolysate, casein, or soy protein isolate: effects on mixed muscle protein synthesis at rest and following resistance exercise in young men.” Journal of applied physiology 107.3 (2009): 987-992.